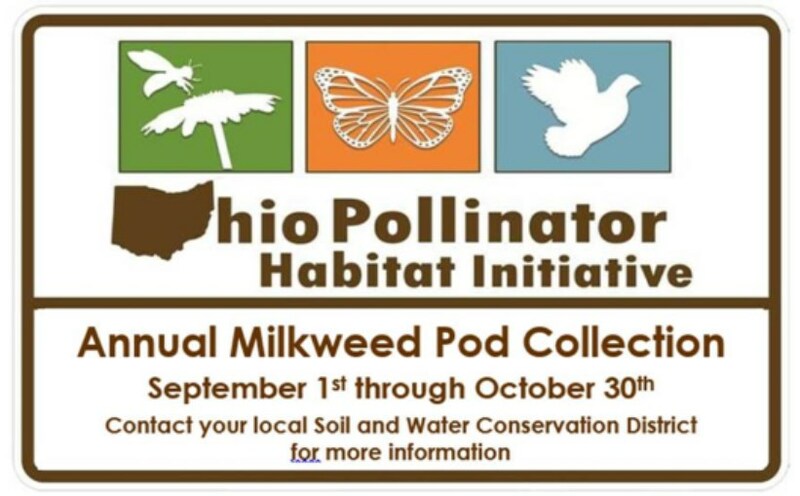 Due to the drastic decline in monarch butterfly (Danaus plexippus) populations, the Ohio Pollinator Habitat Initiative (OPHI) and local Soil & Water Conservation Districts are again seeking public involvement to collect common (Asclepias syriaca) and swamp (Asclepias incarnata) milkweed seed pods from established plants September 1 through October 30, 2017. This is the second year they will be collecting seed pods. The seeds will be used to establish new plantings and additional habitat for the monarch butterfly throughout the buckeye state. These future plantings will increase the food source for the caterpillar stage as seen below. Seed pods from common or swamp milkweed should be collected ONLY WHEN THE PODS ARE DRY & BROWN-GREY in color. If the center seam pops with gentle pressure, they can be picked. The seeds in green pods will not be viable and won't be able to be used. Be patient and don't collect too soon! It is best to collect pods into paper bags. Avoid using plastic bags because they can allow mold to develop. It is recommended to wear disposable gloves when picking and handling pods. It is important to note that harvesting seed pods will not have any effect on the population of milkweed in established areas. For a list of Soil and Water Conservation Districts in Ohio, visit www.ofswcd.org Please direct any questions about this project to your county SWCS office.